Restlessness is an indicator that something’s gotten out of whack. About 1,600 years ago, Augustine of Hippo prayed to God, saying, “You have made us for yourself, and our heart is restless until it rests in you.” There’s an order in God’s design. Restlessness is an indicator that something’s gotten out of whack. A religious teacher once asked Jesus about God’s order, saying, “Which commandment is the most important of all?” (Mark 12:28) Jesus replied that loving God with everything you have tops the list, but an immediate second is to love your neighbor as yourself (Mark. 12:29–31). These two go together, and the second is an outflow of the first (John 15:12, 1 John 4:9). “Discipleship, we might say, is a way to curate your heart,” writes James K.A. Smith, “to be attentive to and intentional about what you love” (You Are What You Love, p. 2). In other words, the things we want and love get out of whack on a daily basis. Following Christ is about allowing things to get divinely reordered, resulting in an end to restlessness and a peace that passes understanding (Phil. 4:7). We need strategic times where we allow God’s Spirit to recalibrate our desires. As I wrote in my last blog, we’re unbelievers, plain and simple. We forget God’s sovereignty and habitually attempt to regain the throne as masters of our universe. This is why we need Sabbath. It’s God’s strategic reminder of whose plan we are caught up in. 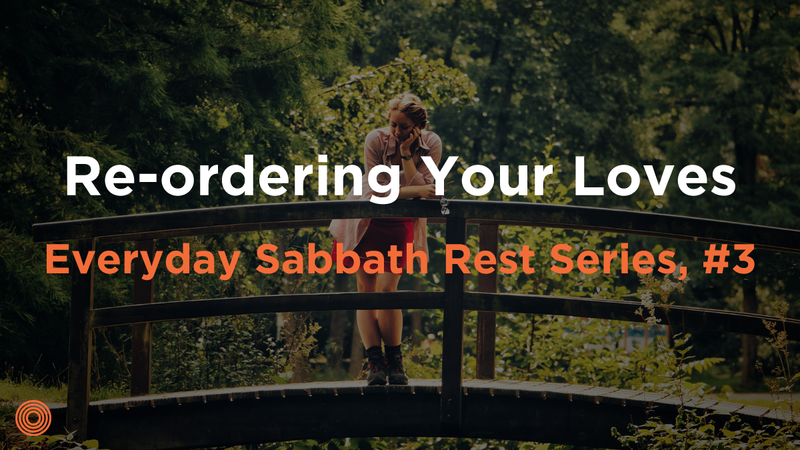 In this third blog on Sabbath, I want to unpack why rest is so important to the missional life. By “missional,” I mean seeing God’s mission as touching every part of my life, especially my relationships. As God freed Israel from Pharaoh’s oppressive rule, he had an interesting job on his hands. How do you re-form the cultural values and beliefs of an entire nation? God reminded them that He was the one who brought them out of slavery and that He expected absolute allegiance (Exodus 20:1–7). No doubt, Israel must have remembered their former governor who considered himself a god. At first, YHWH’s words must have sounded much like Pharaoh’s. Then something strange happened—for the first time in their lives, they were commanded to take a day off, specifically to remember all God had done (Exodus 20:8–11). In his book Sabbath as Resistance, Walter Brueggemann notes how God’s first four commandments were about people’s relationship to Him, but the last six were commands relating to neighbors (Exodus 20:12–21). For the first time in their lives, Israel encountered a governor who didn’t only care about Himself. He cared about their parents (vs. 12), life and safety (vs. 13), exclusive love relationships (vs. 14), personal property (vs. 15), telling the truth (vs. 16), and being content with what you have (vs. 17). Brueggemann writes how this was “unlike any decree of Pharaoh, because it includes the neighbor in the social calculus and dares to imagine the maintenance of a neighborly community. It was not so in Egypt. There were no neighbors in that system, only threats and competitors” (pp. 25–26). God’s people were no longer to live for self-advancement and preservation, but with a mindfulness of the needs of others. God wanted to “sponsor a system of rest that contradicts the system of anxiety of Pharaoh because you are no longer subject to Pharaoh’s anxiety system” (p. 30). In his book Simply Jesus, N.T. Wright shares how “the sabbath was the regular signpost pointing forward to God’s promised future.” We see this promised future as Jesus shows up, saying, “The Spirit of the Lord is upon me, because he has anointed me to proclaim good news to the poor. He has sent me to proclaim liberty to the captives and recovering of sight to the blind, to set at liberty those who are oppressed, to proclaim the year of the Lord’s favor” (Luke 4:18–19). “If the sabbath now has a purpose,” Wright continues, “it won’t be for rest from the work of creation, but rather for celebrating God’s victory over the satan… if Jesus is a walking, living, breathing Temple, he is also the walking, celebrating, victorious sabbath” (pp. 137–138). Recounting Sabbath history helps to give us context. The discipleship life is part of a larger story about a God who cares about redeeming families and neighborhoods, not just me “personally.” Jesus’ life shows us what it looks like to organize around these priorities. 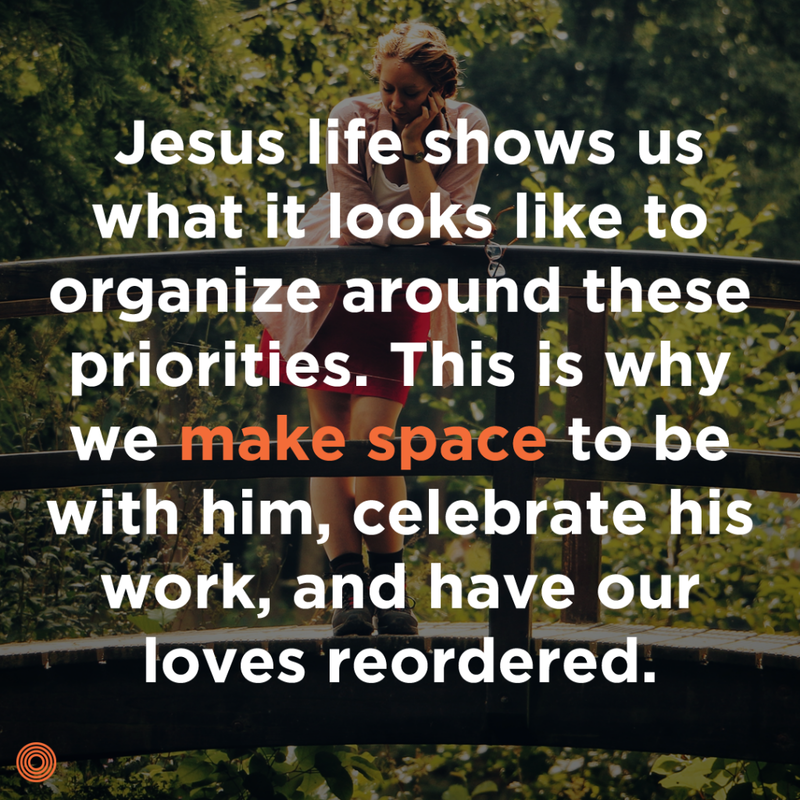 This is why we make space to be with Him, celebrate His work, and have our loves reordered. Many, however, do not see the Christian experience as a life of relationships. Instead, a “me and Jesus” mentality results in isolation and fear. People will hurt me. They will mess up my things. They will drain me. This was not God’s way. “I will bless you,” God told Abraham, “and you will be a blessing” (Gen. 12:2). Later we see Jesus’ invitation for His disciples to “Come away and rest” (Mark 6:31) and “I’ll show you how to recover your life” (Matt. 11:28, MSG). Out of that life we see Jesus command His disciples to “love as I have loved you” (John 13:34). Are you restless? Could it be that something is out of order? When we’re wrapped up in our own crisis, we can’t see out to love anyone. Living at breakneck speeds isn’t a long-term strategy for greater effectiveness. This is why God has likely brought you (or is bringing you) into a missional community. They’ll slow you down and sometimes speed you up. Most of all, they’ll point you to the only one who ordered His life perfectly. It’s in these strategic times away that God reminds us of His order. At lease once a week my wife and I sleep in to get the rest we need physically. Then we have coffee. We talk and remember Christ’s victories on our behalf. Next we ask one another questions to see if we’ve given ourselves over to our culture’s anxiety system. Out of these times, we are reminded that those around are not energy-sapping threats, but agents of grace God is sending us. Because of Christ’s work on our behalf, we remember we are stronger than we think and have more to give than we know. Honestly, we don’t think about planning this time anymore because it’s become a habit. These times change how many hours we work, what we work for, and how we organize our week. My goal for this series isn’t that we’d take a day off. It’s that we’d become a people who consistently make space for God to re-order our loves. This process exposes our hearts and continually reminds us we aren’t that different from the poor, the prisoner, and the sick. Jesus made space for us. Let’s the space for others. What are some practical steps you can take to make space for God to re-order your loves?